FLY THE FREAKY SKIES WITH WORMWOOD CHRONICLES! Grab your airplane gear, space cadets, as we head into the Wild Blue Yonder in search of more FLYING FREAKS! 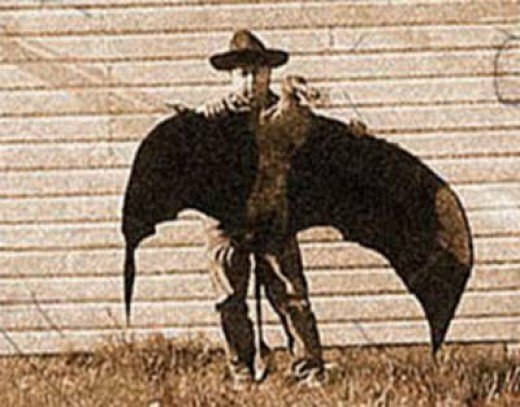 The latest edition of the Wormwood Files finds me on the lookout for gigantic mystery creatures of the skies...monster birds, living pterodactyls, behemoth bats! We travel from the relative cosiness of the American Midwest (some of the most infamous sightings have been made just a few miles from my laboratory!) to the swampy jungle hell of the Congo and the island of Java. You can read all about Thunderbirds, Kongamato and other freaky fliers right HERE! As always, we're working on all sorts of interesting projects here at WC. I can confirm that interviews with SKELETONWITCH and ABSU are forthcoming, with BRUTAL TRUTH, PRIMAL FEAR, BLACK COBRA and WISHBONE ASH good possibilities. Also working on something about Traditional Championship Wrestling. Early in 2012, you can expect to see the largest edition of the Wormwood Top 10 lists ever. As well as the final completion of the massive Wormwood Archives! CHARRED WALLS OF THE DAMNED "Cold Winds On Timeless Days"
PTAHIL "For His Satanic Majesty's Glory"
NEIGE ET NOIRCEUR "Hymnes des Montaigne Noir"